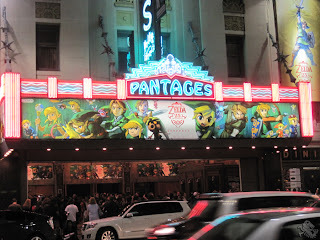 The Legend of Zelda 25th Anniversary Symphony performed by Orchestra Nova blasted us with continuous, eighteen-foot waves of nostalgia, under which we could barely cling to our inner masculinity. And it hurt too good to be true! Conductor Eimear Noone did a fantastic job in bringing the legacy to life through the wide variety of different instruments and sounds, and was clearly well informed about the series, making direct references to its key characters, regions, story events and game titles throughout the performance. On October 21st, the exterior of the Pantages Theater was decorated with artwork of each Link from every game in the franchise (excluding the CDi titles for obvious reasons,) and the interior was lined with tapestries donning the royal family crest. A table near the entrance held T-shirts and posters for sale, and several exhibits all across the floors of the lobby were playing the same E3/Comicon/PAX Skyward Sword demo that we've been sampling all year long. After a pleasant encounter with a good friend of ours who helps run Streetpass OC, we quickly found our seats and prepared our minds and souls to bear witness to the grand sounds of Hyrule's unforgettable countrysides. With an enormous screen behind them, the orchestra kicked things off with a bit of the old Hyrule Castle theme from A Link To The Past. Immediately, we were overtaken by the atmosphere! 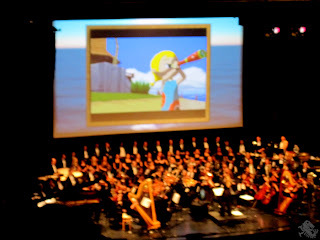 The theme was then followed up by a blast of Zelda's Lullaby (officially titled in the program as “Princess Zelda's Theme.”) The nostalgic aspect continued to rage as the performance changed on into a Wind Waker symphonic movement. It was at this point that the large screen behind the orchestra began to show gameplay footage from the many different events in the game. The screen would then continue to show various scenes from the many titles as the concert progressed. 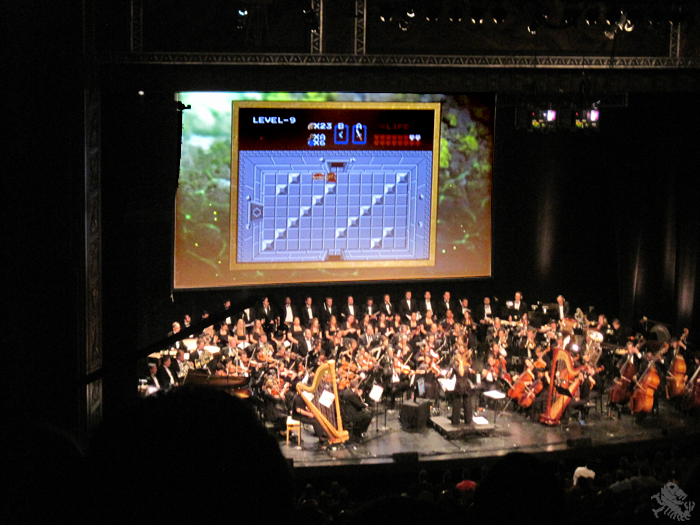 In addition to displaying game scenes, the screen would often show close-ups of members of the orchestra primarily during their solos, as well as Eiji Aonuma during times at which he spoke with Bill Trinen as his interpreter. Next up was a suite of a selected 19 ocarina melodies from Ocarina of Time and Majora's Mask, during which each section of the orchestra played a different song. A boss battle medley that followed the suite was composed of boss music from Ocarina of Time, The Wind Waker, Spirit Tracks and Twilight Princess. The Twilight Princess mood was then continued with its Kakariko Village theme. Part 1 of the performance was ended with a 25th anniversary medley which consisted of music from the triforce room in A Link to the Past, the second field in Spirit Tracks, Dragon Roost Island in The Wind Waker, the light world in A Link to the Past, and another dose of Princess Zelda's theme. After a twenty minute intermission, we returned to the main theater to experience Ganondorf's theme; a point at which the final battles of OoT were shown on the screen. The orchestra moved into a selection of shorts that were chock full of different fanfares and jiggles that occure throughout the series. Then finally, the Gerudo Valley theme! At this point we were so far down memory lane that we didn't even stop to think how much time had passed since the start of the symphony. Then they hit us hard with the main Hyrule field tradmark theme in full orchestra. Lets just say it was emotional. The Great Fairy's Fountain theme, which has been featured in every single title in the franchise, was then alternated between the two harps, followed by the choir, then every other instrument joined in. 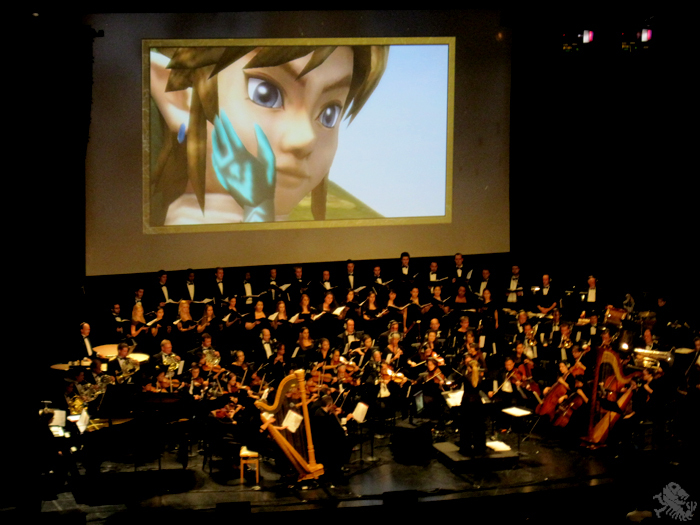 A symphonic movement of multiple Twilight Princess tunes and a medley of music from the original game concluded the main performance. Then as some may have expected the show to be over, we knew there had to be an encore. 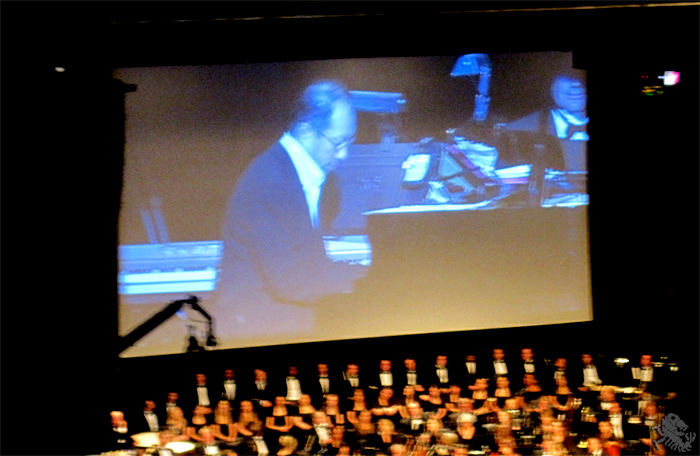 Lo and behold, the series composer and legend, Koji Kondo, made a suprise appearance to play a piano solo medley of Grandma's theme from The Wind Waker. Aonuma made the last parting comments with a little speech regarding Skyward Sword. He pointed out that the music will be tied into how you play. As we already know, certain notes will activate depending on your movements with the Wii Remote. He then closed by bringing up the intensity of emotion that such a performance as this evokes, and that soon we will be looking back on Skyward Sword the very same way. Though it was slightly disappointing to not have heard any musical homage to the Game Boy adaptions, the performance was fulfilling nonetheless. As it came to an end, we stopped to realize how simple it all began, and how amazing it grew up over the past twenty-five years. From hearing The Wind Waker theme to the anniversary medley, all accompanied by the footage of memories that we all shared, we experienced laughter and sobs all in a two-hour-or-so time frame. 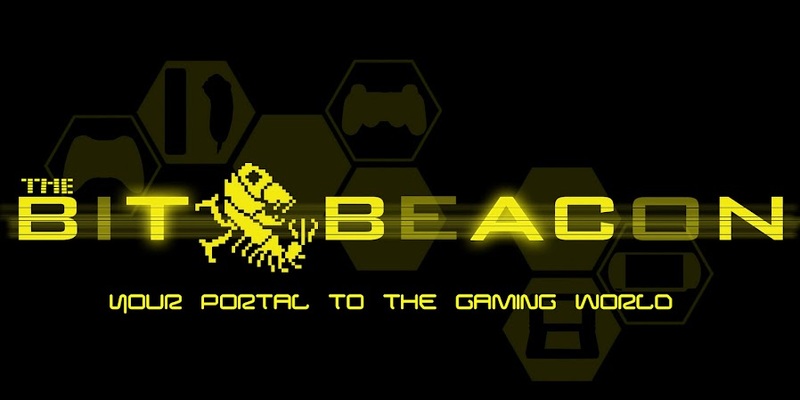 And as weird as I know that sounds, we also stopped to recognized how few video game franchises have the power to do that to a person, and to celebrate twenty-five years of what we believe to be the greatest of those few. One that was that much a part of us, and influences the way we process our views of the world today. Play and you will understand as well. Happy birthday, Princess. Happy birthday, Link. While not featured heavily, you can find hints of MM here and there. This concert sounds like an awesome experience. Can't wait till it comes to Atlanta.